While researching new, unknown threats collected by WildFire, we discovered the apparent re-emergence of a cyber espionage campaign thought to be dormant after its public disclosure in June 2013. The tools and tactics discovered, while not identical to the previous Dark Seoul campaign, showed extreme similarities in their functions, structure, and tools. In this post, we will provide an overview of the original Dark Seoul campaign in 2013, the similarities and differences in tactics, the malware used, as well as attempt to answer the question of ‘why now’? In March 2013, the country of South Korea experienced a major cyberattack, affecting tens of thousands of computer systems in the financial and broadcasting industries. This attack was dubbed ‘Dark Seoul’; it involved wreaking havoc on affected systems by wiping their hard drives, in addition to seeking military intelligence. The attack was initially thought to be attributed to North Korea, by way of a Chinese IP found during the attack, but no other strong evidence of North Korea’s involvement has been produced since then. In June 2013, McAfee published a report detailing the chronology and variance of the Dark Seoul campaign, but renamed it ‘Operation Troy’. The report analyzed the entirety of the purported attack campaign, beginning in 2009 using a family of tools dubbed ‘Troy’. McAfee further attributed two groups to the campaign: the NewRomanic Cyber Army Team and The Whois Hacking Team; both groups believed to be state sponsored. Since the publication of that report, no other activity involving either group or the tools have been detected or shared publically. Using the Palo Alto Networks AutoFocus threat intelligence platform, we identified several samples of malicious code with behavior similar to the aforementioned Operation Troy campaign dating back to June 2015, over two years after the original attacks in South Korea. Session data revealed a live attack targeting the transportation and logistics sector in Europe. The initial attack was likely a spear-phishing email, which leveraged a trojanized version of a legitimate software installation executable hosted by a company in the industrial control systems sector. The modified executable still installs the legitimate video player software it claims to contain, but also infects the system. Based on deep analysis of the Trojan’s behavior, binary code, and previous reports of similar attacks, we have concluded that these samples were the same as the original tools used in the Dark Seoul/Operation Troy attacks. It is likely the same adversary group is involved, although there is currently insufficient data to confirm this conclusion. Both executables present themselves as legitimate installation programs offered by the industrial control systems organization, providing video player software for security camera solutions. When either sample was executed, the malware dropped and subsequently executed the actual video player it disguised itself as. The new malware variant, which we call TDrop2, proceeds to select a legitimate Microsoft Windows executable in the system32 folder executes it, and then uses the legitimate executable’s process as a container for the malicious code, a technique known as process hollowing. Once successfully executed, the corresponding process then attempts to retrieve the second-stage payload. The second-stage instruction attempts to obfuscate its activity by retrieving a payload that appears to be an image file, but upon further inspection appears actually to be a portable executable. The C2 server replaces the first two bytes, which are normally ‘MZ’, with the characters ‘DW’, which may allow this C2 activity to evade rudimentary network security solutions and thus increase the success rate of retrieval. These commands are encrypted/encoded when transferred over the network, as we can see below. The initial ‘tick’ string is hardcoded and must be present for the malware to accept the subsequent command(s). In this case, the initial commands are used to perform basic reconnaissance on the infected host and return the results to the attacker, then initialize a sleep period of 60 seconds. We will publish more details about the TDrop2 malware variant in a follow up blog. 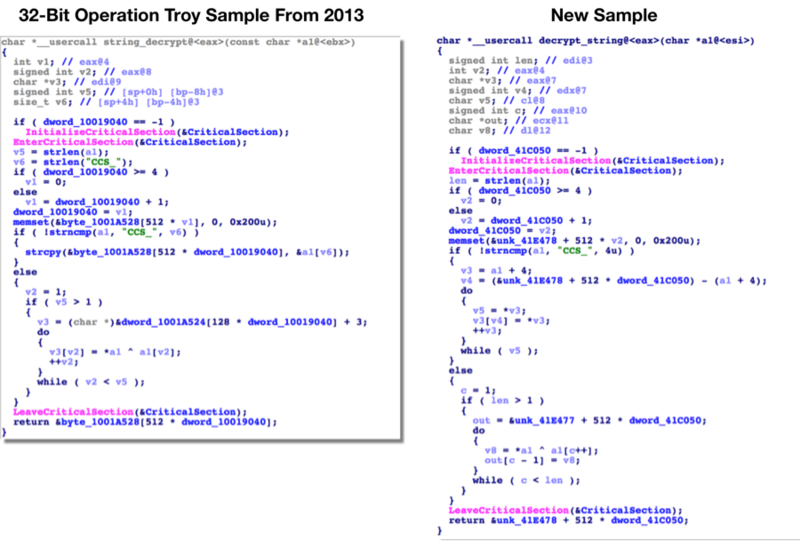 Analysis of the malicious code identified reveals the distinct similarities in behavior and functionality to the original Dark Seoul/Operation Troy toolset. The majority of these samples had debug strings that referenced the ‘TDrop’ malware family, which is likely the predecessor to the malware observed in this campaign and the source of the name ‘TDrop2’. The new variant also uses a distinct string decryption routine, which was also observed in a number of Operation Troy samples. Network communications appeared identical to that described in a Korean blog post written in June 2013 regarding what appears to be a partial analysis of the Dark Seoul attack. The behavior of the analyzed malicious code made references to decoding a PE file from both a .gif and .jpg URL. Additionally, a unique POST separator string is identified (6e8fad908fe13c), which also matches the malware payload observed in TDrop2 samples. The command and control (C2) servers used in these recent attacks are compromised websites located in South Korea and Europe. It’s not clear what led to the compromise of these four web servers (listed in the IOC section below), but they all appear to use shared hosting providers and operate on out-of-date software that may contain vulnerabilities and/or misconfigurations. At this time, it is unclear if this attack is attributed to the same two groups previously outlined in McAfee’s 2013 report. There are obvious similarities in the malware used, as well as other tactics, but there are also some obvious differences. The targeting for example, is completely different in that this observed attack is not aimed at military, government, or financial institutions in the South Korea region. In addition, there has been no evidence of destructive functionality in the samples analyzed by Unit 42, although the malware is capable of downloading additional components so those simply may not yet have been observed. The similarities in tactics however, do seem to outweigh the differences, and it is highly likely this is the same group or groups responsible for the original Dark Seoul/Operation Troy attacks, but with a new target and a new campaign. It is not uncommon for threat actors to become dormant for some period of time, especially after public unveiling as the groups behind Dark Seoul/Operation Troy experienced. What we do know is that changing infrastructure and toolsets can be challenging, and it is not nearly as common that a very specialized tool developed for specific teams would be shared amongst threat actors. There is insufficient data at this time to clearly state why Dark Seoul/Operation Troy would resurface at this time, but Unit 42 will continue to monitor the activity as the situation develops. We have created the AutoFocus tag TDrop2 to identify samples of this new variant and have added known C2 domains and hash values to the Threat Prevention product set. At this time, WildFire is able to correctly identify the samples associated with this campaign as malicious.